Quilted Northern Ultra TP - Just $0.47 per Double Roll, Ships Free! 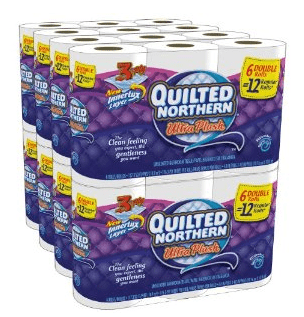 Quilted Northern Ultra TP – Just $0.47 per Double Roll, Ships Free! Hurry over to Amazon and find a nice toilet paper deal! Right now you can get 48 rolls of Quilted Northern Ultra Plus toilet paper for just $22.47 when you order with Subscribe & Save. At that price, each double roll is just $0.47 each, so each single roll is just $0.24! Even better, your order will ship FREE! Darn – it says “currently unavailable” right now!